STAR WARS AFICIONADO WEBSITE: 'STAR WARS' AT 40: HOLLYWOOD AND GALACTIC ROYALTY! 'STAR WARS' AT 40: HOLLYWOOD AND GALACTIC ROYALTY! At Elstree Studios, June 16th 1976, a near 20 year old Carrie Fisher, a known name helpful in selling STAR WARS as the daughter of superstar Debbie Reynolds, sits down for an in-house filmed interview. As with Mark Hamill's talk on this set, we assume the interview was handled off camera by Gary Kurtz, and likely shot by documentarian Peter Shillingford. Only a few brief moments of this interview have appeared publicly. 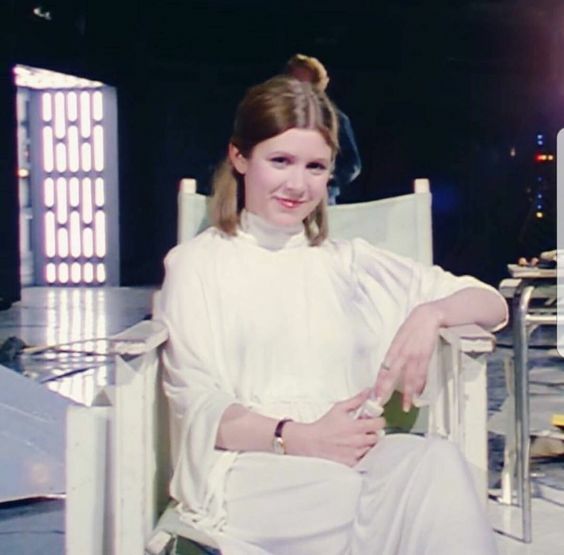 With the upcoming first anniversary of Miss Fisher's sad passing, the 40th Anniversary of STAR WARS coming to an end, and her final appearance as Leia with The Last Jedi, it would be a lovely gift to fans if this interview could be released online to the fanbase, If you're reading this LUCASFILM/DISNEY, we hope you will oblige us with this continued tribute to a much-missed woman and talent. Thank you.